How Risky Is NVIDIA Corporation? Despite a lofty valuation, graphics chipmaker NVIDIA is far less risky than meets the eye. While the saying, "What goes up must come down," applies in plenty of situations, it isn't always the case in investing. In fact, buying shares of world-changing companies and holding them for the long term can lead to gravity-defying results. 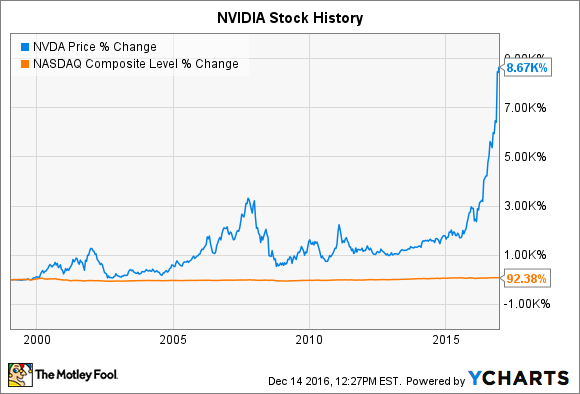 Case in point: shares of graphics-chipmaker NVIDIA (NASDAQ:NVDA) have charted an enviable trajectory up and to the right since the company's IPO in 1999. NVIDIA's enviable place at the center of several of tech's largest growth markets has made its stock one of the best performing large caps of 2016. The downside of that growth? NVIDIA stock trades at a valuation more than double the S&P 500, belying expectations of continued long-term growth. So how risky is NVIDIA for investors today? Let's take a look. It's hard to find a company that's better situated at the epicenter of some of tech's largest growth markets than NVIDIA. The longtime leader in graphics computing had struggled to define a future growth course as recently as five years ago. However, thanks to the graphics-intensive nature of technologies like artificial intelligence, self-driving cars, machine learning, and eSports, NVIDIA has seen an absolute explosion in demand for its graphics-processing units, or GPUs. Here's a snapshot of how each of its four-core operating segments performed in NVIDIA's most recently reported quarter. Image source: NVIDIA investor relations. It also appears that business momentum in many of its growth areas is accelerating faster than the analyst community realizes. For example, in NVIDIA's recent earnings report, Wall Street expected the chipmaker to notch sales of roughly $1.4 billion -- the company guided for $1.68 billion. However, NVIDIA's whopping $2 billion in actual sales demonstrated that companies are snapping up its graphics chips nearly as fast as it can produce them. The average analyst is expecting sales to climb only 15% next year, but recent evidence certainly suggests that the investing community continues to underestimate the magnitude of NVIDIA's potential growth. So what are the potential downsides with NVIDIA stock? NVIDIA stock: What could go wrong? Few companies in recent memory have as clearly defined leadership positions in so many sizable, long-term growth markets. As was the case with smartphone makers in 2007-2008, many of the trends underpinning NVIDIA's future growth are vetted to the point where they are indeed credible. Self-driving cars and artificial-intelligence software should become widespread over the next decade. As such, the main problem I can see with NVIDIA isn't the likelihood of its revenue growth coming to fruition, but the price investors will have to pay to participate in its growth story. Here's a quick rundown of a few of NVIDIA's most relevant valuation metrics. Clearly, NVIDIA's stock isn't cheap. However, valuations cannot be viewed in a vacuum. The context as to why a company trades at its valuation matters as much, if not more, than its multiples. So yes, NVIDIA is expensive. Its 63 P/E ratio equates to an earnings yield of about 1.5%. Through a gross oversimplification, the long-run return for stocks has been somewhere in the range of 6%-8%. The important implication here is that NVIDIA is priced for massive growth. Equally important, NVIDIA appears capable of growing into and beyond this multiple. Here are a few data points to support this point. Researchers estimate that virtual reality and augmented reality device shipments will surpass 100 million by the year 2020. Additionally, self-driving car sales are expected to exceed 10 million vehicles by 2020, which represents just a tiny sliver of the total automobile market. Even if these estimates fall short by a meaningful degree, NVIDIA should experience outsized growth well into the future. As such, NVIDIA remains an expensive stock, but one whose growth potential makes it far less risky than it appears at first glance. Get the latest NVIDIA stock news and facts.